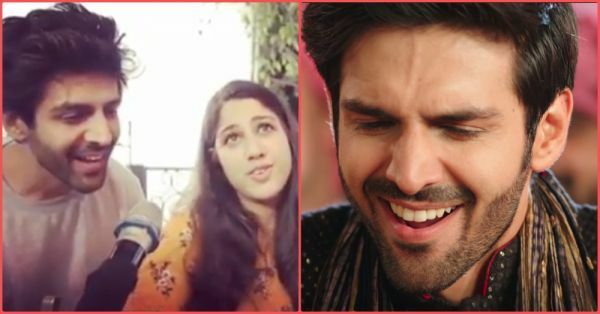 Video: Kartik Aaryan Singing 'Tera Yaar Hoon Main' Made Our Day! Kartik Aaryan is a multifaceted actor - he can narrate monologues like a pro, and apparently, he is also a charming singer! The actor, who is currently shooting for Imtiaz Ali’s next film, had a fun time meeting his fans in Delhi. A production house from his upcoming movie, Window Seat Films, shared a video of the actor in which he is seen singing the song Tera Yaar Hoon Main, along with Samahita Narang. Kartik reposted the video on his Instagram and captioned it: "Verified. If you have a signer like @samahita1 den everything sounds surila 😁 My voice is good I think😂 🙈"
OMG! He can sing too. Kartik Aaryan sang this song in his movie Sonu Ke Titu Ki Sweety, which went on to become a blockbuster at the box office. After Luka Chuppi, Kartik Aaryan will be seen opposite our current girl crush Sara Ali Khan in the Love Aaj Kal sequel. Apart from Sara, Kartik will also be working with Ananya Pandey and Bhumi Pednekar in Pati Patni Aur Woh.